When asked, "Which do you prefer--country-fried steak or chicken-fried steak?" some people have a definitive answer because they grew up loving one or the other. Other people react to this question by scratching their heads and replying, “Is there a difference?” Many people think they are just two names for the same classic Southern dish, but that is not completely accurate. The "fried-steak" concept is believed to have been brought to the South by German immigrants in the middle of the 19th century. Germans are known for the somewhat similar dish wiener schnitzel (breaded and fried veal cutlets). The history of the names "country-fried" and "chicken-fried" is debated, however. Some believe the name “country-fried steak” goes back to the mid-1800s (although there doesn't seem to be much record of that--just evidence of the dish itself), and the term “chicken-fried steak” didn't emerge until the early 1900s (perhaps on a restaurant menu in Colorado, according to the Oxford English Dictionary). While some think the names are interchangeable, others believe that there are significant differences, but let’s get the similarities out of the way first. Variations do exist, but the basic formula for both country-fried and chicken-fried is the same: you take a piece of steak (usually tenderized cube steak), dip it in a batter, fry it in a cast-iron skillet, cover it with gravy and serve. Now to the main distinction. There is one clear difference between the two dishes: the color of the gravy. 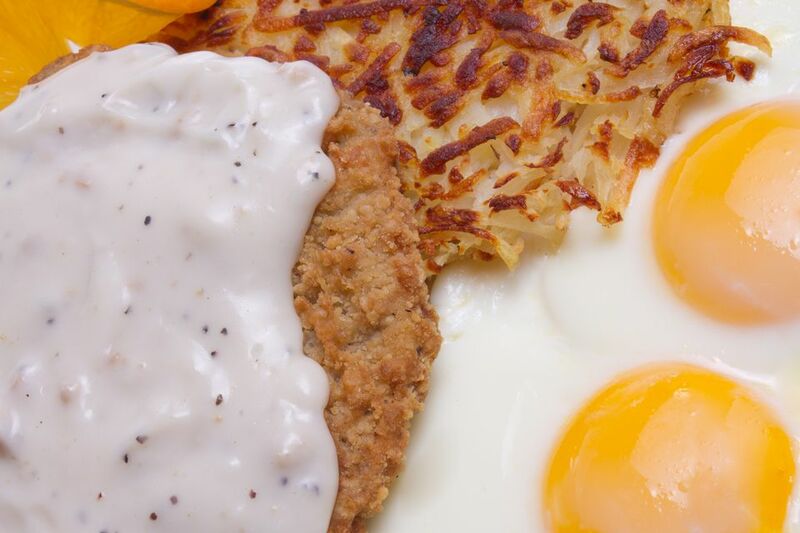 Country-fried steak is covered in brown gravy, while chicken-fried steak comes with peppery white gravy. To add to the confusion, even this isn’t entirely set in stone--some restaurants will serve “country-fried steak” with white gravy. Other differences are more subtle. Chicken-fried steak usually has a crispier coating. Sometimes, chicken-fried is even served with the gravy on the side to allow the crispiness to be fully appreciated. Country-fried steak, on the other hand, is sometimes smothered with gravy before the final stage of cooking, so that the outer layer gets infused with the sauce. One final note to clear up a common question: why is it called "chicken-fried" if there's no chicken in it? Chicken-fried steak gets its name because it is prepared in the same manner as traditional fried chicken. To make matters more confusing, some restaurants serve a dish called “chicken fried chicken” which is a boneless filet of chicken prepared in the manner of chicken-fried steak.